Americans spent nearly one-quarter of their time online visiting social networks and checking blogs, according to a report by Nielsen. Facebook was named the top social media destination, taking up more than 53 million minutes from 140 million visitors in the United States for the month of May. 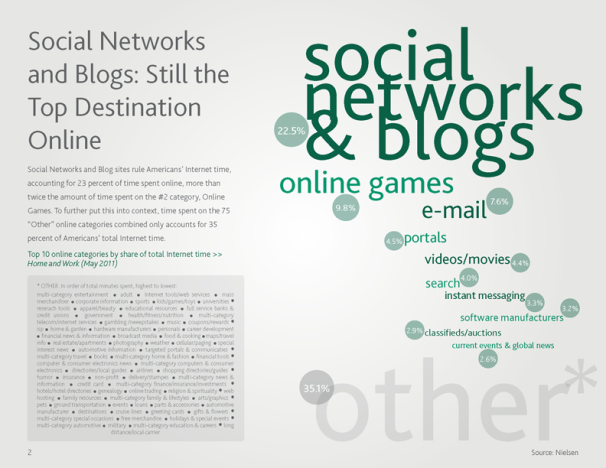 Blogger was the next most popular destination among American social media users. But the Google-owned brand's audience of more than 50 million in May was nearly three times smaller than Facebook's, according to Nielsen's quarterly social media report. After Americans are done spending 23 percent of their time swapping photos, links and status updates, online gaming is the next most popular online activity, albeit a distant one. Just 9.8 percent of Americans' time online is spent on gaming, less than double the amount of time spent on social networks. After gaming, U.S. users turn to e-mail (7.6 percent), online portals such as Yahoo and AOL (4.5 percent), online video (4.4 percent) and search (4 percent), according to Nielsen. 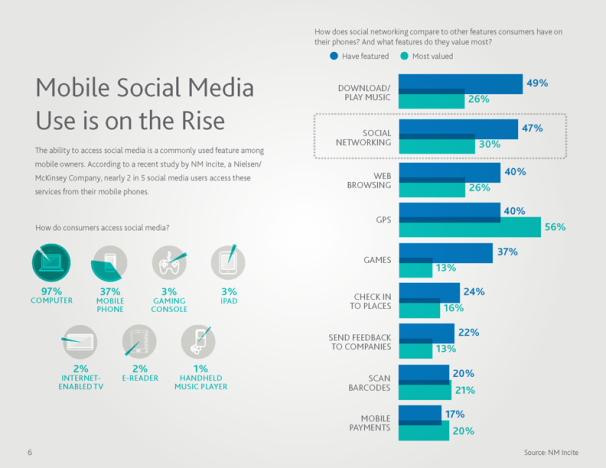 To get their social media fix, 37 percent of U.S. social media users are turning increasingly to their mobile phones to get online. This trend is being driven in part by the popularity of smartphone apps as a convenient way to check Facebook, Twitter or LinkedIn. Social networking app usage grew by 30 percent compared to the same time last year. Americans over 55, meanwhile, have been popularizing the mobile Internet for social media usage. U.S. seniors turned to the mobile Internet instead of apps for social media more than twice as often over the past 12 months compared with younger age groups. Nielsen also has some good news for PC makers. While mobile device usage is growing, PCs are still the most popular way to consume social media, claiming 97 percent of social media users. And while the iPad may be a popular way to watch movies, check e-mail, or read a book, it turns out Apple's tablet is not the go-to device for social media consumption, at least not yet. Just 3 percent of social media users in the U.S. pull out their iPad to check Facebook or Twitter feeds, according to Nielsen. Of course that may be a numbers game since there are far more PCs out there than iPads. And if Facebook ever releases its long-rumored iPad app for iPad or its equally rumored iPad-optimized website, iPad usage for social media may increase by 2012. Other interesting findings from the Nielsen report include the news that Tumblr, the blogging service, has tripled its audience over the past year, and that women between the ages of 18 and 34 are the most active social networkers, but men make up the majority of the audience on LinkedIn and Wikia.com.